Stuffing mushrooms just makes something wonderful even better! But what you stuff in these tasty little vegetables can make or break the dish. Typically, mushrooms are stuffed with foods containing saturated fats and sodium. So, if you’re trying to watch one or both of these, consider various herbs and spices – they do a nice job of seasoning many of favorite foods! 2. 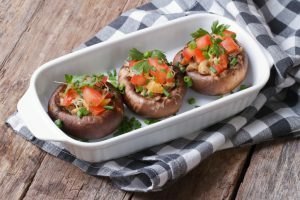 Clean mushrooms with a paper towel or vegetable brush; remove stems to use for the filling. 3. While oven is warming, put mushroom caps (open side down) in oven for 10 minutes. This will prepare the caps for stuffing. 4. Chop the garlic and onions and sauté with 1 tsp olive oil. One minute before they are finished, add the four herbs. After 1 minute, remove from heat. 5. In a large bowl, mash mushroom stems and chickpeas. 6. Add all other ingredients. Mix well. 7. Lightly spray a baking sheet and the mushroom caps. 8. Stuff the mushrooms with the mixture and place on baking sheet. 9. Bake for 15-18 minutes or until the stuffing is golden brown. 10. Remove from oven, sprinkle with an herb of your choice, and enjoy. Posted in Recipes. This entry was tagged diet, health, healthy, herb, recipe, recipes. Bookmark the permalink. Previous: Swapping ground turkey for beef: Is it always the best choice?